Yes, it's a lazy recipe. As I was making this, lil' sis made a face. 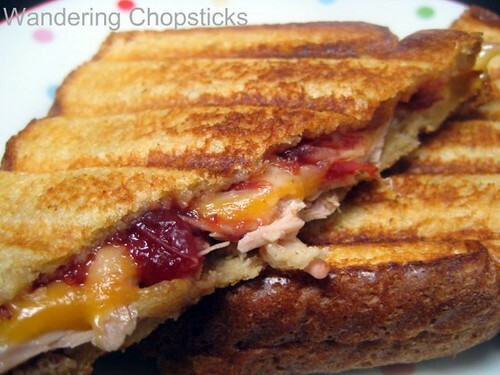 Turkey and grilled cheese is fine, but a turkey, grilled cheese, and cranberry sandwich? I let her take a bite. Slice the turkey and cheese. Spread cranberry sauce on one slice of bread. Lightly butter the outside of each side. Place the sandwich in a George Foreman grill or toaster oven until the cheese melts. Yippee! This is the last of my 2008 posts! All 2008 entries are now caught up! 1 year ago today, my favorite banh beo and other Central Vietnamese food at Quan Hy Vietnamese Restaurant - Westminster (Little Saigon). 2 years ago today, Fosselman's Ice Cream Co. - Alhambra, which boasts 16% butterfat in their ice cream. This is the PERFECT leftover thanksgiving dish EV.ER. i don't think i can eat cheese, and i don't like cranberry sauce, but i'd totally take a bite (or two or three) off your sandwich! :) i bet that bread is so crunchy, the cheese all perfectly melted... i also bet your turkey isn't dry. I can imagine how good this will taste! Especially with the panini press. A bit of a unusual combination but it sounds so good and tempting! This looks amazing... I would have never thought so if someone suggested the idea without a picture... but I want to eat this when the big turkey day is just behind me. Of course my turkey isn't dry. Dry-brining all the way! It's everything that'd be on my plate for Thanksgiving sandwiched in between two slices of bread. Well, and with cheese. That's how my sister felt. She scrunched up her nose, but she sure liked it after she took a bite.